For boys who are in Fourth Grade and/or are 10 years old. to burn safely, safely extinguish the flames with minimal impact to the fire site. determine if the goals were met. 3. Plan a menu for a balanced meal for your den or family. Determine the budget for the meal. Shop for the items on your menu while staying within your budget. participating in a service of worship or reflection helps you live your duty to God. month. Write down what you will do each day to remind you. 1. Understand and explain why you should warm up before exercising and cool down afterward. Demonstrate the proper way to warm up and cool down. running. Time yourself going through the course, and improve your time over a two-week period. 6. 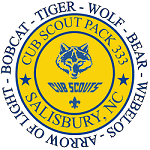 With your Webelos den or with a family member, hike 3 miles (in the country, if possible).